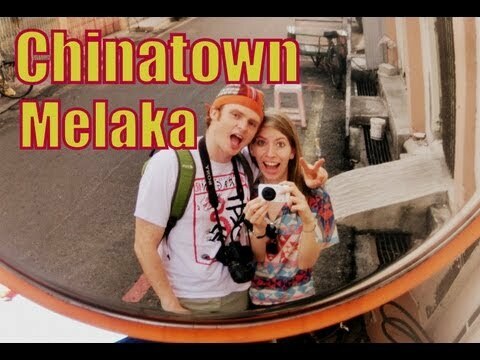 This is a travel video of us wandering around and exploring crumbling colonial mansions, Chinese temples and other landmarks in Chinatown located in the heart of Malacca (Melaka), Malaysia. With our guesthouse situated in this area we’ve quickly taken a liking to this neighborhood. With plenty of shops, restaurants, colonial buildings and temples to visit we spent hours walking around. One of the first things we noticed were the red lanterns galore. Literally, they were everywhere in this Chinese neighborhood. Malacca is known for its colonial architecture and in my opinion has done a better job preserving its heritage than George Town, Penang. Along the way we encountered cats and dogs, rickshaws and plenty of other attractions. As goofy as we often are I started doing the Gangnam Style dance by Psy beside a horse mural. His music is really popular right now in SE Asia. Recently he held a concert in Penang that was a major hit. As pet lovers, we were thrilled to encounter many cats and dogs along the way. Many of them were docile, given the heat and humidity, sleeping in the shade. The highlight of our morning was visiting the Cheng Hoon Teng Temple, which is a temple that celebrates a number of different faiths: Confucianism, Taoism and Chinese Buddhism. With a mixture of different faiths there is a unique blend of incense candles, red dragons and well manicured fruit trees. The most iconic landmark in this neighborhood for me is the Orangutan House. Run by local artist Charles Cham, it’s a place where backpackers can get hand drawn t-shirts. Every time I come here, I load up on his t-shirts and during my 2010 backpacking trip I only was wearing t-shirts from his shop! We passed along Jonker Street, which is completely different by day than it is by night. By day there is traffic and most of the shops are closed; however, at night it turns into one of the most popular areas for pedestrians to shop, eat and mingle.